When Jacqueline Woodson started winning awards, I hadn’t read any of her books. I decided to rectify t hat, and we chose this book on a library outing. We’ve had it out a couple of times, because it is excellent. When you read it, you understand why Jacqueline Woodson wins awards for her writing. The story is about family, and connections that remain strong even as families move. 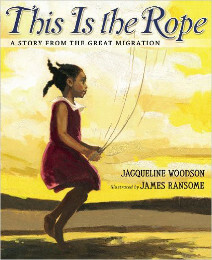 It is told using a rope that journeys with a particular family as it travels from South Carolina to New York City, as part of the Great Migration that brought so many African-American families north. It is a beautiful story on many levels. The illustrations are also beautiful.